Here is the third and last of my “what I did on my summer holiday” posts for this year! Probably the biggest highlight of the Scotland trip was a one-day Three Isles Tour of Mull, Iona and Staffa, involving no fewer than five boat trips and two bus journeys (the latter complete with highly entertaining commentary from the driver). There is nothing particularly fortean about the big island of Mull – though it’s very picturesque – but both Iona and Staffa have interesting legends associated with them. 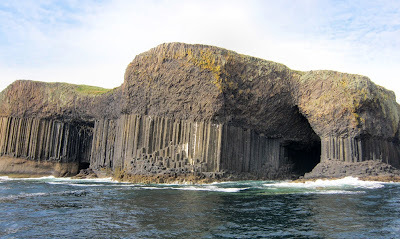 I’ll start with Staffa (pictured above), which is the more visually spectacular of the two. Staffa is a small uninhabited island, and a relatively new one in comparison to its neighbours. Geologically, most of the Scottish “highlands and islands” date from the Caledonian orogeny 400+ million years ago. However, Staffa popped up only about 60 million years ago, when the Atlantic Ocean began to form. As North America pulled away from the British Isles, molten magma was forced up through the rent, and where it reached the surface it cooled to form basalt extrusions. Staffa is one of these – the Giant’s Causeway on the north coast of Ireland is another. When basalt solidifies from a molten state, it has a distinctive way of forming into interlocking hexagonal columns. This is a perfectly natural process, but the result is so artificial-looking that it has given rise to a variety of myths and legends. According to one tradition, Staffa and the Giant’s Causeway are the two ends of an 80-mile causeway that used to link Ireland and Scotland. It was supposedly built by the Irish giant Finn Mac Cool (quite a well-known figure in Irish mythology – he appears in Finnegans Wake for example). After building the causeway, Finn was involved in a battle with a Scottish giant named Benandonner. The Irish and Scottish versions of the legend differ as to which of the two giants won, but they both conclude with the destruction of all but the two ends of the causeway. Over the years, legends have attached themselves to Staffa for the simple reason that it’s such an extraordinary sight. In contrast, the nearby island of Iona is a fairly ordinary-looking place (at least, the Mull-facing coast that we had time to explore is) ... but it has an extraordinary history. As I mentioned in last week’s post about Loch Ness, St Columba was the 6th century Irish monk who first brought Christianity to Scotland. Iona is the place that he set up the first Scottish monastery, in 563 AD. As far as I can tell, this much is real history – although many of the details of Columba’s life (including his encounter with the Loch Ness monster) are likely to be legendary accretions. Columba’s monastery, Iona Abbey, became an important centre of “Celtic Christianity” during the Middle Ages. Sadly it fell into ruin after the Protestant Reformation of the 16th century – and then (almost as sadly, in my opinion) the ruined buildings were completely rebuilt in the early 20th century. This makes it almost impossible to get a feel for the mediaeval Abbey today. Ironically, one of the oldest objects still standing doesn’t look very old at all (either in its design or its state of preservation). This is St Martin’s Cross, pictured on the left below, which dates from the 9th century ... 1200 years ago! If you look closely you can see the decoration includes a number of snakes, which seem strangely un-Christian symbols (and un-Irish ones, for that matter). 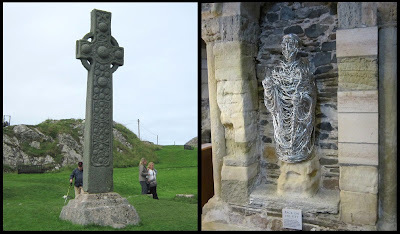 More obviously old-looking is the statue of St Columba, in the right-hand image below. I don’t mean the wire mesh statue (which is very modern), but the mediaeval stone one – of which only the highly weathered feet remain! My father was Scottish and he told me that Iona was the burial site of the "ancient kings of Scotland" (I don't know if that's true). And John Smith, the Labour leader, was buried on Iona in 1994. Thanks for bringing this up Colin - I was going to mention it in the post but then I decided it was long enough already. There is an old cemetery next to the Abbey, which all the guidebooks say contains the graves of numerous early kings of Scotland, including Macbeth. However, there is an information board at the cemetery itself saying (in yet another example of "Scottish skepticism") that it's probably just a myth that was concocted to draw pilgrims (aka mediaeval tourists) to the site, and there is no real archaeological or documentary evidence to support it. But it's absolutely true that John Smith is buried there - I took a photo of his grave. It's probably bad taste to suggest that he's probably turning in it right now, seeing the despicable antics of a certain other "labour" Smith at the moment!